These brownies are insanely good! This is the perfect dessert to wow your guests! Cream butter and sugar together. Add eggs and blend well. Add vanilla, salt, cocoa and flour. Don’t overbeat. Pour into a greased 9X13 pan. Bake at 350 F for 20-25 minutes. Allow to cool completely. While brownies are cooling, make Oreo truffle layer. Crush Oreos finely in a food processor or by putting them in a ziplock bag and smashing them until finely ground with a rolling pin. When Oreos are finely crushed, using hands (or a spoon, I just think hands are faster), mash softened cream cheese and crushed Oreos until well combined. Start with 4 oz and keep adding until desired consistency is reached. 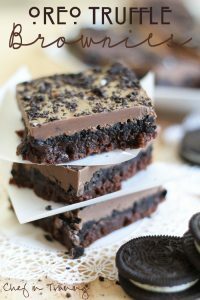 When Brownies have cooled completely, place layer of Oreo truffle on top. Evenly spread over the top of Oreo Truffle layer.